Pretty much every Spirit brand worth it salt these days runs a global cocktail competition. In this age of social media and three minute You-tube clips the potential for free brand marketing is hard to ignore as is the seemingly never ending global Cocktail renaissance. On an International scale Bacardi Legacy is one of the big boys. The blurb on their site reads “The BACARDÍ Legacy Cocktail Competition is not just looking to crown the best drink or bartender of the year; it is looking to find the next Legacy Cocktail”. This year it’s held in Sydney, Australia. In 2010 I was lucky enough to be part of Team Ireland that competed in the 42 Below World Cup in NZ. It’s staggering how many of the guys competing that week, my team mates included, have gone on to become Brand Ambassadors or involved in the upper echelon of the Drinks Industry. Make no mistake, winning, or even placing well at Bacardi Legacy is a serious stepping stone in a bartender’s career. Say cheerio to long split shifts and howrya to company credit cards, international travel miles and global recognition. The Irish final was held in the Odeon in Dublin and The Daily Pour went to suss it out! The nervous energy amongst the ten finalists was palpable. They had been whittled down from over sixty entries and represented a mish mash of age and experience representing nine of Dublin’s top boozers. The Daily Pour was keeping close tabs on Micheál O’Shea from The Marker Hotel. The Cork native had just taken Gold in the Create it, Mix it, Shake it competition at CATEX and Micheál told us how he’d taken a bit of confidence from the win. “I just don’t want to get up there and hit a blank spot, I don’t think I will. I can fly there with the best of them, I just need to get up there and get it done, get all your information, tick all the boxes”. His performance was strong, controlled and clinical and earned him an agonisingly close second place, beaten on a marginal points difference. The ’emotional roller coaster’ performance of the night went to Conor Myers with his drink ‘ Mountain to Sea’. In the build up to the Competition, Conor took his drink literally across the Sea to London. Eric Lorincz of The American Bar @ The Savoy was even pictured mixing it up. The audacity of youth! At the Odeon there had been a few issues with the mic so Conor opted to do his presentation without it. Immediately this created a feeling of togetherness in the room as he talked us through his bond with the Bacardi Electric Picnic family. His personality is quite infectious and his time will come. Karl Ussher with his drink, Ron de D.O.M. opted to throw his cocktail and his presentation was excellent but placed a lot of emphasis on the science of dilution. Robert Caldwell from Peruke and Periwig produced a drink called ‘Cuban Caramel’. A drink based around Coconut water and Pedro Ximenez. He was confident on stage describing his drink as ‘subtle yet versatile, dominant yet complementing anything it was served with’. His video was also pretty funky. Winner of the best marketing campaign was Will Lynch, his drink ‘Set Sail’ was really enjoyable. Will organised a session on a boat (A motherfucken boat!) but rather than notify Dublin’s motley crue of booze hounds by text or Facebook, bars received a message in a bottle inviting them to the event. Will also took the Gold Medal in the cheesetastic category with his final line of, “There are many ships in the sea, but the only ones that matter are friendships”. Beautiful. Dave Taylor of ‘Peruke and Periwig’ got the ball rolling with his Cocktail, ‘Viva Cuba’. Bacardi Superior, Creme de Mure, Fernet Branca, Lemon and Apple Juice. His marketing campaign included a snappy Dubstep powered video. Richie Delahoyde from Dublin cocktail institution, VCC prepared a drink called ‘Eris’, Bacardi, Lime Juice, Kummel, Cinnamon, Vanilla and Apple Syrup. One of the great aspects of this years Legacy competition was it felt like a changing of the guard with a lot of the usual suspects not competing. There’s no doubt if Richie stays under the tuition of Gareth and Pat we’ll be seeing lots more of him over the years. Dave Green of Ruby’s made a drink called ‘Past and Present’, Bacardi Superior, Apricot Brandy, Lime juice and honey infused Cabernet Sauvignon. 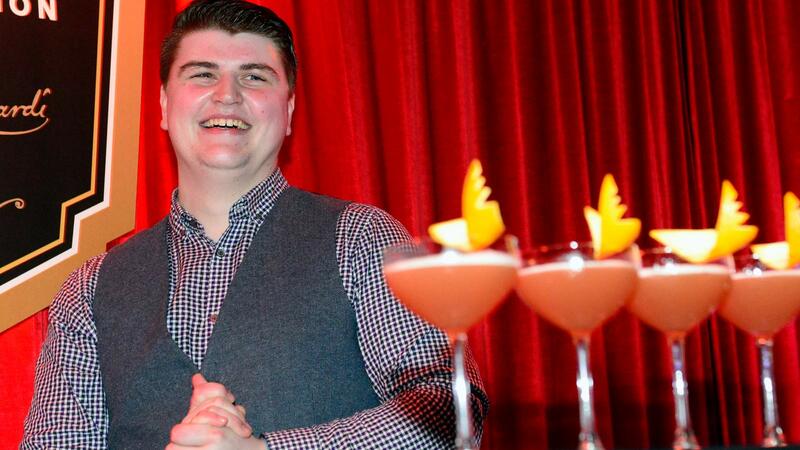 Tom Doran from ‘The Mint Bar’ at the Westin Hotel took the Bronze with ‘Tropicana’, a fruity concoction of Bacardi Superior, lime juice, Vanilla syrup, Orgeat with Mango puree and a Dry Vermouth rinse. Again an enjoyable well balanced drink. When you draw parallels between previous winning drinks at Bacardi Legacy, one of the themes that keeps cropping up is their relative simplicity. As Bacardi Global Brand Ambassador, David Cordoba explains “It achieves the perfect mix of the perfect ingredients, offering a balance and flavor and simplicity that I believe will endure and make it a classic of the future”. The winning drink of SABA’s Karim Mehdi at the Irish final epitomized these characteristics. ‘Simply Garrigue’ is light and herbal with a long finish. Unlike several of the drinks in the final this drink could easily be replicated. Karims story is one of determination and persistence as he came close to winning at the previous Legacy competition. What do you do when you nearly win with a drink you believe in? Do you scratch it and start all over or do you tweak a few things and go again? Karim chose the latter and it payed off. You could tell he’s made this drink hundreds of times and he appears to have formed an emotional attachment with it. 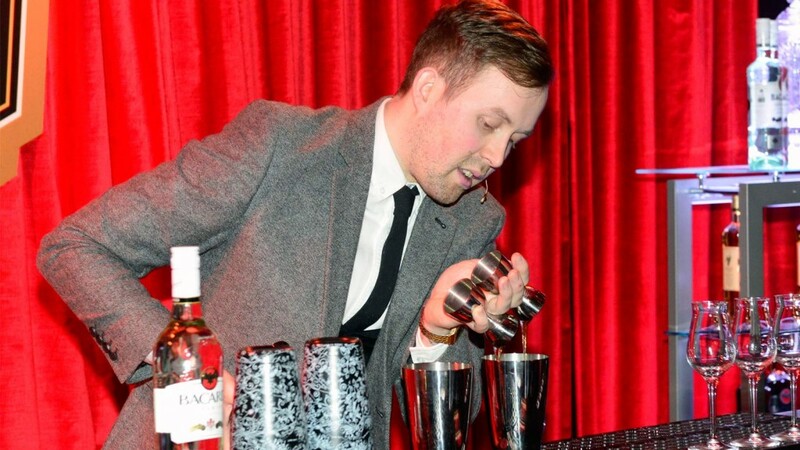 He will give us a really great chance of doing well at the Bacardi Legacy Final in Australia in May. We caught up with him straight after his victory and asked him if he’d been quietly confident? “I had great belief in my drink but I wasn’t overly confident. The other contestants delivered so well. Obviously watching them, you go, ‘OK, they are really, really good. The standard was amazing!’” Karim went on, “This cocktail is me; this is what it relates to. It’s really close to my heart actually, where I live and where i’m from and it related to Bacardi a lot with Don Facundo also being from Sitges”. The warmth and respect shown to Karim by the other contestants is a testiment to him. Everyone of them was obviously gutted but nobody begrudged him his victory. For Cork’s Michael it was a case of so close but yet so far. He’d finished runner up by a whisker. 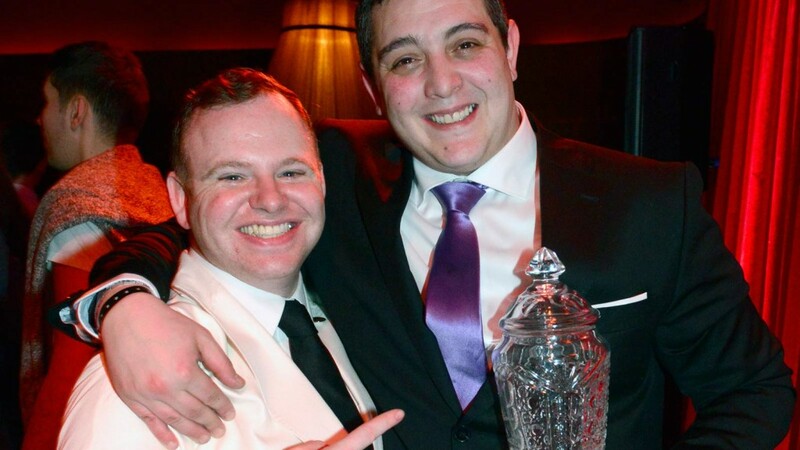 It’s five years since I had the pleasure of competing at that 42 Below World Cup and in that time the Dublin Cocktail scene has gone through the roof. For those of us in the Cocktail Industry in other Irish cities it’s hard not to be envious. It has a cocktail community and culture which is constantly evolving and refusing to sit on its laurel’s. Each bar is driven by a desire to be the best and eventually one of them will land a Spirited Award, or entry to the World 50 Best Bars. It’s inevitable. You can’t under-estimate the power of sharing knowledge and creating an environment where ingredients, products, methods, techniques are spread amongst the industry. We’re blessed to have London an hour away and it’s an inspiring city to immerse yourself in, but it’s not just London, it’s drinks literature, it’s travel, it’s going to as many whiskey and gin tastings as you can. It’s complete immersion. 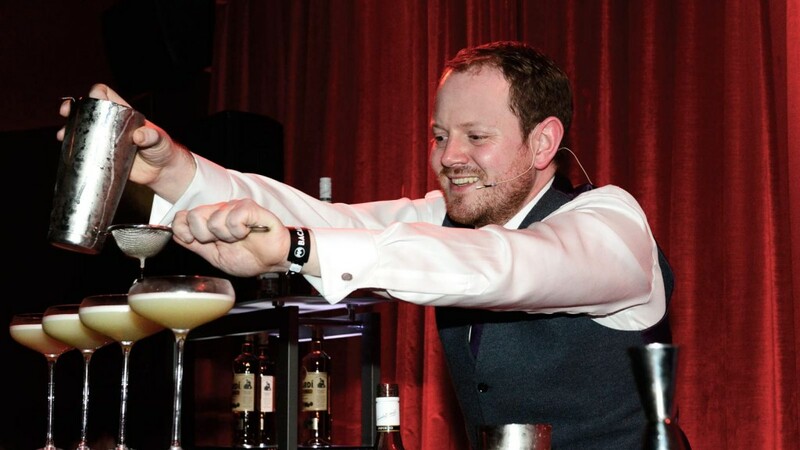 In the last six months, Oisin Davis of Great Irish Beverages has hosted the first Dublin Cocktail Festival and the inaugural Dublin Whiskey Festival with literally dozens of bars getting involved. MVP had the balls to host Tippletown not long after they opened. It’s this determination and a real sense of community mixed with a centralised population that will eventually put Dublin up there with other great European Cocktail cities like Copenhagen, Munich, Glasgow. Massive hat tip also to the drinks companies that are finally stocking our shelves with quality spirits and giving our Industry legends like Bacardi’s Alan Kavanagh. There can be no doubt we are in the midst of a booze renaissance in Ireland’s capital.